Delivered at Congregation Beth Shalom as part of its monthly Shabbat Shiur series on November 12, 2016, four days after the presidential election. כי תבנה בית חדש When a man builds a house, this is a person, an individual, and with us Jewish people it usually happens, they came from foreign lands in poverty and misery, naked and barefooted, and in many cases they are driven out by tyrannical rulers from their old homes, and finally arrive in this land of the free. And with the help of God they have prospered, and through their industry and usefulness; to the extent that they can build a home for themselves, it becomes their duty, to pause, and meditate about their past and draw a lesson and moral about the happenings of their past lives, and remedy the errors, or transgressions they have previously committed; and try to avoid the pitfalls which are always staring before their eyes. In August 1901, Ignatz Grossman read these words at the cornerstone-laying for Homestead’s first synagogue on the ironically-named Ammon Street. 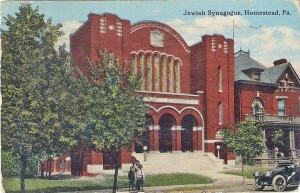 Today that street no longer exists on the map; the site of the former synagogue is now a low-income apartment complex. In the talk I had originally planned to give this afternoon, “Barney and Ike: A Tale of Two-and-a-half Secretaries,” I would have highlighted this milestone in the Jewish history of Homestead as marking the first known occasion in which Ignatz collaborated with my great-grandfather, Bernhardt Hepps. Bernhardt chaired the building committee; Ignatz served as its secretary. They worked together for over five decades running Homestead’s synagogue, B’nai B’rith Lodge, B’rith Abraham Lodge, and likely also various Jewish social and political and charitable organizations along the way. And yes, they both frequently served as secretary of these organizations. My intended talk would have reviewed the various synagogue records, speeches, newspaper articles, and even private love letters that led me to discover and theorize why Ignatz had held a certain animus against my great-grandfather. Although it’s one of my favorite threads of research from my Homestead project, both for the personal connection as well as the records and interpretation involved, given the events of the past week it feels silly, almost tone-deaf, to focus on such a trivial story when the voices of the Homestead Hebrew Congregation are speaking to me so loudly and so urgently about what is the meaning of this moment in which we find ourselves. Ignatz and Bernhardt were both born in the Austro-Hungarian Empire in the 1860s. Ignatz came to the U.S. in 1881 just before his Bar Mitzvah at the very beginning of the wave of Jewish Hungarian immigration. He finished growing up on the Lower East Side with his parents and eight siblings and lots of cousins and aunts and uncles. Bernhardt’s arrival was quite different; he came to the U.S. in 1888 as a single young man, charged with establishing enough of a foothold to bring over his two older brothers and their families, and his five, much-younger, half-siblings. Anyone who frequents the public places of this town, cannot help but be struck with the number of new and strange faces to be seen, and the difference in nationality, manners and dress. There is a heterogeneousness about our public gatherings which impresses one…Among the several thousand who have come into our town during the last year or so, are many excellent people who will eventually become prominent in our social and business interests. Their rowdy, multi-day weddings were a particular object of horrified fascination and frequently led to arrests. In January 1897 the Braddock paper wrote, “It is the practice here now to have a policeman at every Hungarian wedding to preserve order.” The Homestead paper retorted, “Only one policeman? Well, Hungarian weddings over your way must be sort of love affairs.” For many years news items like this one from 1899 cropped up: “The same old story. A Slavish wedding ends in a fight.” Apart from weddings, news items on their fighting and arrests were frequent. To the extent to which the paper shaped public opinion, no one–by which I mean, no English speakers in Homestead–could escape the regular reminders theme that the Eastern European immigrants were their inferiors. Before and especially after the strike, the paper wouldn’t dare criticize the steel mill management, who favored using them for low paying, unskilled labor, but when workmen were needed for borough projects like street paving, they went out their way to avoid hiring them. Naturally ostracization, ridicule, harassment, and poverty did not lead to the assimilation of the Hungarian community, who had few personal incentives even to learn English, as many saw their presence in the U.S. as only temporary. I’m going into so much detail about these foreigners, because otherwise it’s impossible to appreciate how remarkably another set of foreigners, our Jewish ancestors, fared in the paper. To some extent the paper showed the town’s hand when it wrote that they hoped the foreigners would become “prominent in our social and business interests.” It’s clear from their treatment of the Hungarians they didn’t fling open a door of welcome, but they did set the terms by which a person could enter if he aligned his behavior and interests with the town’s. Especially in these early years they recognized, at times with desperation, the need to build up local trade, so the presence of Jewish merchants aligned with their interests. 7/16/1896. 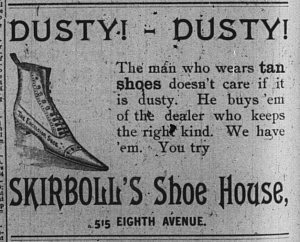 Avoiding dusty shoes was important in a town with few paved roads. And yet, already at the time of that 1888 article, the town’s first two Jewish arrivals were rising to the mark set by the paper. With their eponymous stores in central locations in town and their advertisements regularly in the paper, their names would have been recognizable–and their faces, too, given the size of the town. The first, Abraham Skirball (yes, that Skirball! ), was described by the paper in mid-1888 as “a well known citizen of Homestead” with “the qualities of a good business man.” An 1896 Allegheny County business directory elaborated that he “owes his present standing in the community to hard work, personal energy, thrifty habits, and well-directed effort.” His daughters graduated high school and his sons college, both sets of accomplishments extremely rare in those days. Their recreational activities, reported in the newspaper’s “Local Briefs” column, suggested integration with their non-Jewish peers. The second man, Ralph Segelman, a jeweler and first president of the Homestead Hebrew Congregation, was described in his 1894 obituary as “a modest man of correct habits and a good citizen in every respect.” He donated to the town’s Civil War memorial and fund for the Johnstown Flood victims. His children, like Skirboll’s, were also the only Jews on youth sports teams. Most tellingly, both Segelman and Skirball belonged to local lodges (non-sectarian groups whose membership was largely native-born Americans). Skirboll had immigrated to the U.S. fifteen years before he arrived in Homestead, Segelman more like 3-5, and both had been in business elsewhere before arriving in Homestead. They already knew the rules of integration and forged a path that many followed after them. One of the next Jewish residents to rise to the town’s notice was Isadore Grossman, Ignatz’s older brother. He opened a store in town around 1887 and the paper reported on his comings and goings and building activities – both business and personal – in its “Local Briefs” section. Even Ignatz’s arrival in May 1894, to clerk for his brother, was announced in the paper! 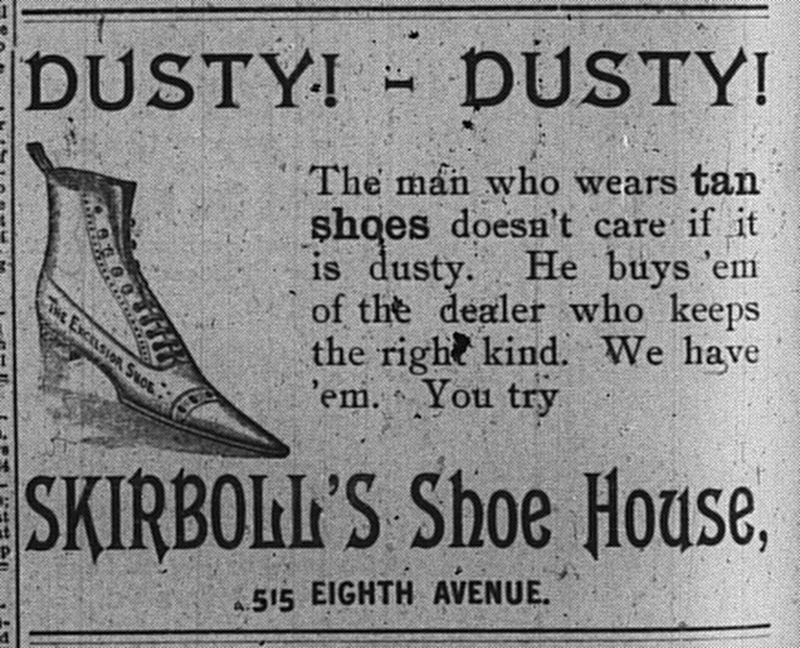 By 1897 Isadore was “entitled to rank as one of Homestead’s most enterprising business men.” Ignatz upgraded himself from clerk to shopkeeper that year as well. Soon enough he, too, took his place as “one of Homestead’s most substantial businessmen.” And I could keep on going – this was a well-trod path. 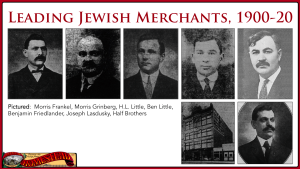 Starting around the turn of the century the number of Jewish merchants multiplied. The majority of early synagogue members had stories like these. They became “well-known,” “progressive,” and “enterprising,” and their businesses “first class,” “successful,” and “attractive.” One was eulogized as “highly respected by all who knew him. 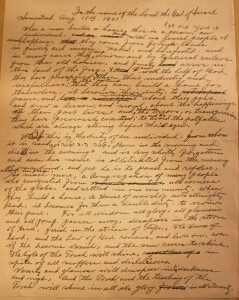 He was a fair minded man and made friends with all whom he came in contact.” In the interest of time – and your attention span – I won’t continue person-by-person, compliment-by-compliment, but the sheer weight of the evidence in the paper – their openings, sales, relocations, renovations, travels, illnesses, simchas, and tragedies – produces quite an effect when taken together. There was a clear place for Homestead’s Jewish residents to fit in. They could rise. Note that use of the word “Hebrew.” This was a rare usage! Hebrew was the paper’s adjective of choice (as it was the Jewish community’s, hence the name of their shul: Homestead Hebrew Congregation), but it was deployed sparingly. While African-Americans were always indicated as “colored” or “negroes”; Chinese as “Chinamen,” “chinks,” or “Celestials” (yes, there were Chinese laundrymen in Homestead from the beginning and a Chinese restaurants around the turn of the century); and foreigners, as I mentioned, as “Huns” or “Slavs,” Jews were rarely ever identified as such. Once an anonymous “Jew rag peddler” was fined, later a “Hebrew peddler” was almost robbed by a “Hun,” another peddler called “Jacob Jew” tried to sell without a license, and so on, but such usages only appear when applied to strangers at the bottom of the social ladder. Surprisingly, even when Jewish residents were arrested for bad behavior, whether letting their cows wander around town, throwing garbage on the street, robbing rival stores, selling illegal liquor, running disorderly houses, or even having permitted “spooning” and other improprieties at one’s saloon (the latter was one of the most protracted non-political scandals in Homestead’s early history), they were never identified as Jews. (I know they were Jews because of my research.) Even in the much-maligned local liquor establishments, where Jews like my great-grandfather had a sizeable presence, its businessmen were publicly excoriated without anti-Semitic overtones. The only slur I ever saw in the paper was “sheeny,” and that in a letter-to-the-editor that I will discuss shortly. Only when it was germane and harmless was a Jewish person identified as such. For example, calling my great-grandfather a “Hebrew citizen” in that earlier quote highlighted the background of the donors to the charitable collection he had taken up (for a non-Jewish cause). The most frequent set of such harmless occasions where the “Hebrew” identification was deployed were Jewish social events, which were referred to as taking place in “Hebrew society circles.” Although Jews and non-Jews mostly socialized separately (apart from the fraternal groups, where there was growing up evidence of Jewish businessmen’s participation and even leadership), by the turn of the century Jewish social events got significant, front-page coverage. “Impressive Ceremony – Orthodox Hebrew Wedding Last Night” read the headline of one very long, front-page article; another from the following year read, “A Brilliant Hebrew Wedding – Many Homesteaders in Attendance.” Infrequently I read about non-Jews at Jewish social events, whether at weddings like these or children’s birthday parties, but apart from sports teams I didn’t see an instance of the reverse, though the “Local Briefs” would sometimes mention outings of a few mixed friends. As they rose, some began to assume leading positions in the town. The first Jewish policeman, Morris Fogel, joined the local force before 1902. The first Jewish bank director, Isadore Grossman, was elected in 1903. My great-grandfather, the second, was elected the following year. It doesn’t often occur that a candidate for public office receives the unanimous vote of his own party at the primaries, and then to the be given unsolicited endorsement of the leading opposition party, shows that the man so honored, must have been qualifying himself through many years of past private and business life to receive such singular tokens of confidence and appreciation at the hands of his fellow citizens, among whom he has resided and by whom he is so well known. The first Jewish councilman, Morris Frankel, was appointed in 1907. He had been a peddler when the synagogue was organized; now he was “one of the richest men in town” whose “success has been entirely due to his own efforts.” He didn’t hide his roots. “He is always to be found with the working classes from which he sprang.” And his son’s Bar Mitzvah speech was printed in the newspaper! 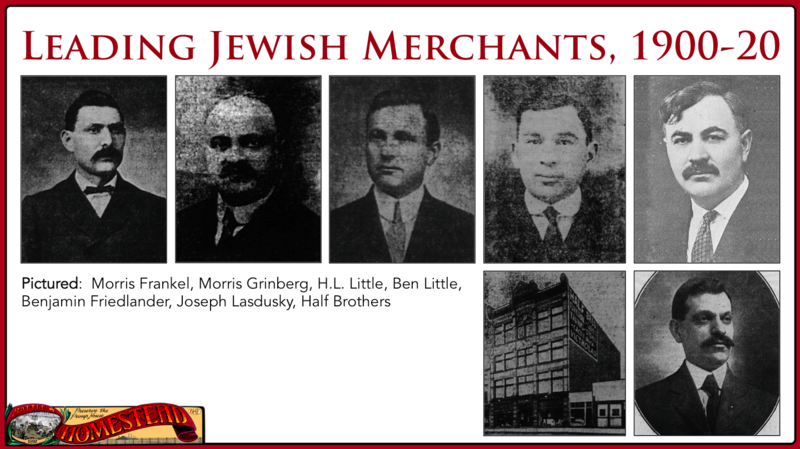 These men were not only the leading Jewish merchants in Homestead, but also amongst Homestead’s most active civic leaders. Their children were advancing rapidly, too. From the very beginning the Jewish community’s kids were graduating high school, girls were going to teacher’s college, and boys to four-year college (even to Ivy League schools). Councilman Frankel’s son went to Harvard in 1908 and then onto Harvard Law. Before 1905 there were a couple at pharmacy school and a couple more in medical school – all of them immigrants themselves. We all know the shape of this narrative, but what strikes me is how quickly and thoroughly all this happened. We all know that these anecdotes represent the American Dream in action, but it has had a profound effect on me to see how it happened step-by-step, day-by-day, for my ancestors and their community in an initially small, homogenous town. When I think on it, I am overcome with gratitude for the America they saw. In this, our feastly mood, we must not forget that our wealth and earthly possessions we have all acquired in this great commonwealth, in this famous town, Homestead. My friends, not only in ancient times, but also recently, we have seen miracles performed. We are all aware that none of us came to this town the possessor to any extent of earthly wealth, and now, through thrift, industry and indulgence, we all have accumulated a certain amount of wealth, and all are more or less in easy circumstances. We all prosper in business, the majority of us own our own homes, and we as a congregation, also possess a mortgageless synagogue which is a miracle in itself, therefore there is ground enough for us in memory of the suffering of olden times, compared with the liberty and prosperity we enjoy at present, to celebrate the feast of Chanuka. It’s true that Jews in small towns tended to keep their heads down. But in Homestead that didn’t mean that they were reluctant to exercise their rights as citizens or flex their political muscle. From the very beginning even those who might seem to have had no ability to wield clout at all brought cases before the local magistrate. 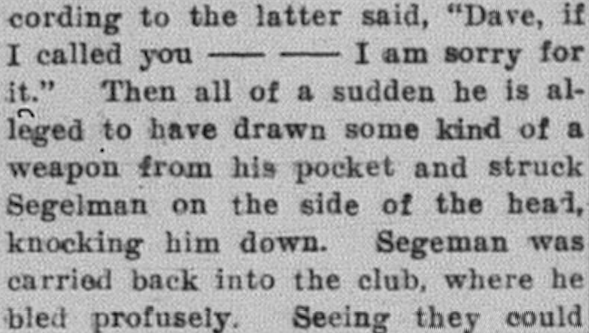 In 1893 my great-grandfather’s brother, a peddler fresh off the boat, charged a man with stealing his potatoes. The steady stream of such incidents, especially involving robberies of people’s stores, shows that they could and did stand up for themselves. Sometimes they were the target. In early 1904 when it seemed like the borough’s ordinance officer was singling them out for violations, they did not hesitate to publicize the matter to the paper: “Considerable indignation is being expressed by the Jewish residents and store keepers of the Second ward, over the action of Officer Smith in making so many charges against them, they claiming that he is aiming at them exclusively and that he does not pay attention to any other violators.” An investigation ensued. They organized in larger ways, too. In February 1900, at the height of election season, the paper wrote, “The Hebrews of Homestead believe they are becoming numerous enough in Homestead to make their power felt in politics if they stand united.” They formed a club, which grew by the October 1902 election season. “There are about 85 Hebrew voters in town and this cuts quite a figure when all are thrown one way, as they probably will be.” Here are Jews wielding power, and yet I perceived no anti-Semitic digs by the paper. Once again, they responded publicly. In a telling incident later in 1907, the year of the Cox letters I read earlier, the paper published a rare reference to a “Russian Jew peddler.” The next day the paper noted that, “The Hebrews of this place take exceptions to The Daily Messenger referring to the peddler arrested for selling without a license yesterday as a Russian Jew, they taking the grounds that there was no necessity to refer to the man being a Jew any more than if he had been a Catholic, a Methodist, or of any other religious denomination.” The paper apologized immediately. “The reporter in writing the article used the term Russian Jew as a general term unthinkingly and had no thought of giving offense to any one.” And such an incident never recurred. It is easy for me to get carried away. The newspaper is an imperfect source. Its aim was to present the growing town in the best possible way, and even without that bias, struggling people weren’t newsworthy unless they became public charges or criminals. The day-to-day, lived experience of the average member of the Jewish community is difficult to discern. They must have endured anti-Semitism in a way that did not come through in the paper. For this time period the only source I have apart from the newspaper is the oral history of Jacob Rader Marcus, who was a child in Homestead at this time. He claimed he didn’t encounter anti-Semitism. When the paper wrote about peddlers running into trouble, was it because they were Jewish, or because they were vulnerable? When a three year-old boy was hit with a rock, when an older boy was hit with a brick, when a grown man was beaten up – were they singled out for being Jewish? When three Jewish boys were tricked into missing their high school graduation dance were they targeted for being Jewish or for being accessible to the pranksters? Was the attempted arson of the store of another one of my great-grandfather’s brothers anti-Semitic? 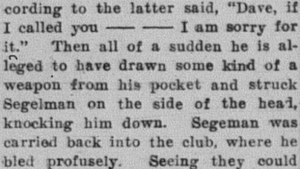 Surely in 1904 when Segelman’s son got into an argument with a non-Jewish friend, when the paper claimed the friend said, “Dave, if I called you ____ ___ I am sorry for it” before the friend stabbed him, surely the words the paper would not re-print were a vile, anti-Semitic epithet? Impossible to know. But families like his read the newspaper, too, and saw a town whose narrative as the “greatest industrial district in the world” left room for its Jewish American residents to be counted amongst its leading businessmen and philanthropists. 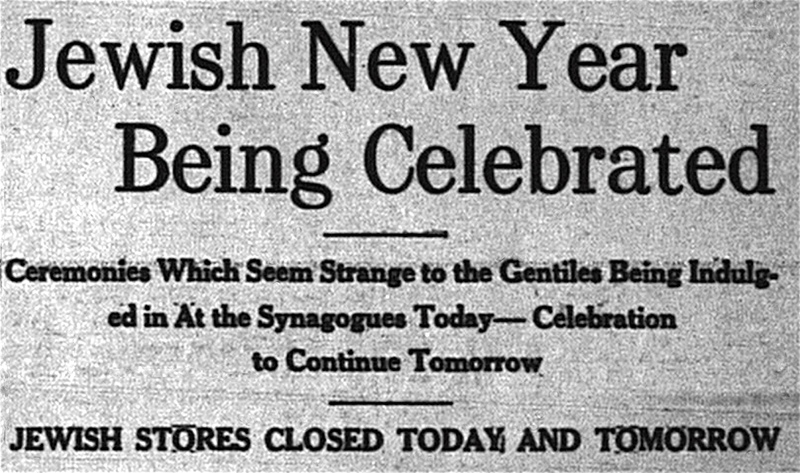 Every time they opened the paper the Jews of Homestead saw Jewish stores and Jewish celebrations and Jewish organizations and individual Jews mentioned in ways ranging from matter-of-fact to laudatory. The paper normalized their presence and set a civil tone at a time when it undermined other minorities routinely. There were implicit social boundaries within Homestead, yes, but there was room in the narrative. And that was something novel. Each new wave of Jewish arrivals in Homestead saw the evidence of what their the earlier arrivals had already achieved, and it had to have given them hope. It was the picture of the promise of America, even if they were struggling to get there. It was more than they had in the places they left behind. And by and large, each successive generation managed to rise as this first one had. The town made room for those foreigners who were willing and able to comport themselves according to its standard of conduct. But what about when they behaved in ways that emphasized their differences? After all, the Grossmans and the Heppses and all these other families viewed the blessings of “this land of the free,” as Ignatz put it, as more than just economic and social ones. Freedom of religion – or rather, freedom from persecution for religion – was foremost in their minds. From the beginning, the paper suggests a willingness by the town to support its Jewish resident in these efforts, too. 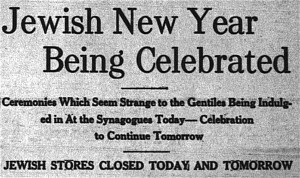 Their early High Holiday services were in their neighborhood’s fire house, and along with this announcement the paper explained to the town in some detail when and why Jewish stores would be closed, which turned into an annual ritual in itself. 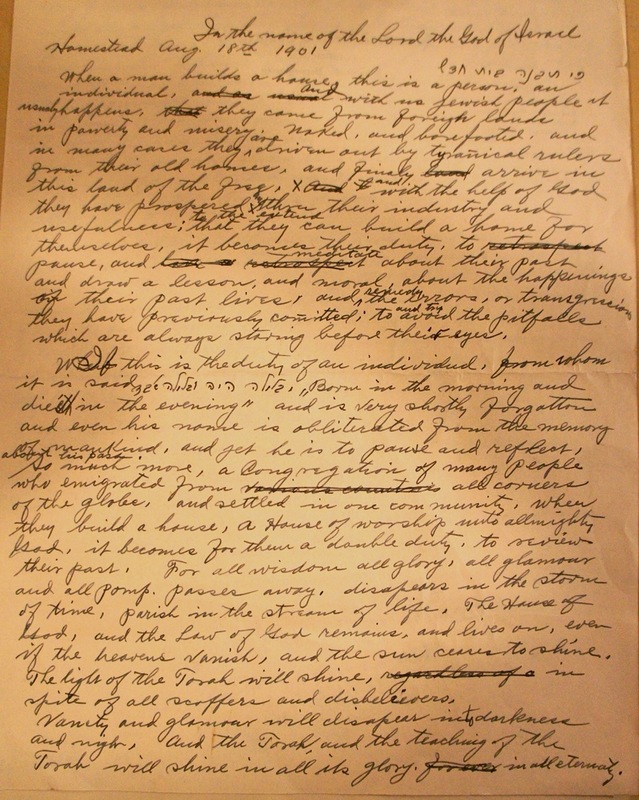 All the early milestones about the formation and growth of the congregation received such attention, because all of the steps involved were “novel…to those who know nothing about their customs.” The articles suggest a respectful fascination, not the faintly-concealed disdain that often surfaced with other ethnic groups’ cultural anomalies. Taking the ball as a whole it was one that reflects with great credit upon the congregation which is striving to raise a sufficient sum to erect a synagogue, and they deserve the success with which their efforts met last night…. The members of the Rodef Sholom congregation are among the leading business men of the town and it is expected that their many friends will join with them in helping to make the annual ball this year an affair to be proud of. attended by all the Jewish families of the town along with many of the more prominent Gentiles. The dedicatory exercises…[were] entirely unlike any dedication of a house of worship ever before held in this place, one notable feature being the participating in the exercises by people of all denominations, Protestants, Catholics and Hebrews alike [took] part and [delivered] addresses, something unusual anywhere. The diverse attendance is especially notable when you consider that the dedication took place on Easter Sunday in the midst of a smallpox epidemic! [Our congregation has] adopted this as our motto, “How Good and pleasant it is when brothers congregate with Unity of thought and unity of action for the promotion of Good.” How well we lived under this banner since our organization we can safely leave to the decision of the good citizens of our town, and we feel that we can say with pride that their verdict must be such as would make any presiding officer proud of his members. We have proof tonight of the respect and esteem in which the Hebrews of Homestead is held by our Gentile friends and neighbors for looking about us we can see the most prominent citizens of our town honoring us with their presence at our table, willing to break bread with us and thereby showing that we have their well wishes while we celebrate the dedication of our new synagogue. These words tug at my soul. “Honoring us with their presence,” “willing to break bread with us”: having non-Jewish leaders, even the burgess (mayor), present to witness, to celebrate, the community’s accomplishment was clearly something for which these recent immigrants were genuinely grateful. Heartbreakingly grateful, I’d say: this synagogue would be burned in an arson nine years later. Though the congregation believed the culprit to be “an enemy of their race,” the town would accuse them of destroying it for the insurance money. In the places they left, did non-Jews honor Jews with their presence? Were non-Jews willing to break bread with Jews? In the world we lived in, we take all these interactions for granted. We take them for granted because that first generation negotiated the boundaries of contradictory identities and age-old prejudices to create mutual respect and acceptance where it had not existed before. Willing to break bread with us. My Facebook feed this past week has been filled with images of swastikas – on a storefront in the city in which I was born, on cars, on cemetery walls. The KKK is planning a victory rally in North Carolina. Minorities nationwide are reporting an onslaught racist and homophobic and xenophobic taunts. What is unraveling right now? How far back will this set us? I remember how I felt when I first read these words in 2010. I was aware that I took their implied blessings for granted, and I wasn’t ashamed of that. In fact, it gave me a kind of joy to know the world had come so far that a Jewish American like me couldn’t even imagine things otherwise. In a way, it seemed, my complacency was a testament to the strength of what they built. Once those words made me well up for stories too painful for our forebears to tell about themselves. Now those words make my heart wrench for the stories that await us. The talk I had planned to give would have been accompanied by a handout on which I had arranged two versions of the congregation’s history written by Ignatz ten years apart. In one my great-grandfather’s name appeared in various places; in the other it was everywhere removed. Ignatz was for first fifty years of the congregation’s existence its self-appointed historian. No one stood in his way to keep him from crafting the narrative he wanted, one in which his enemy played no role. Now, in the congregation’s unlikely afterlife, I am his successor. I get to correct the record. Cue my originally planned ending, a rousing chorus of “Who lives, who dies, who tells your story” from Hamilton. “Who tells your story?” Suddenly looking back in this way seems like a luxury. How can we focus on how to retell the past when it’s entirely unclear how to live our story in the present? I don’t know what is the meaning of the increasing acts of anti-Semitism, homophobia, xenophobia, racism, misogyny, and general hate we’ve seen in recent days and will surely continue to see for some time. I don’t know how they compare to what our ancestors accepted about this very imperfect country that permitted them such miraculous advancement. In recent days I’ve read countless lists of at-risk communities – lists written by laymen, lists written by Jewish activists, lists written by leading politicians – all people who pride themselves on their pluralism – almost all lists that exclude Jews. Our ancestors would be stunned to see that their greatest victories – earning acceptance as whites, gaining privilege despite anti-Semitism – now obscure our urgent need for allies. We have a narrative like no other group of immigrants in this country and that gives us important obligations – to others as well as to ourselves. How do we balance the enduring moral imperative, “?וכשאני לעצמי, מה אני” (“If I am only for myself, what am I?”) with its foundation, the increasingly urgent, “?אם אין אני לי מי לי” (“If I am not for myself, who will be for me?”) of the present moment? How do we perform tikkun olam (repair the world) and still ask for help for ourselves? We lose control of our narrative when we hesitate to prioritize it. Looking at the whole arc of our narrative, my thoughts gravitate towards another mishnah from Pirkei Avot, “אל תפרש מן הצבור” (“Do not separate yourself from the community”). If the early Jews of Homestead managed to sway the sentiments of their nativist neighbors where other groups did not, it was accomplished by becoming part of the larger community and affirming their positive values. At the moment that door may still be open for us in a way it is not for women who wear hijabs or men with turbans or people with brown skin. 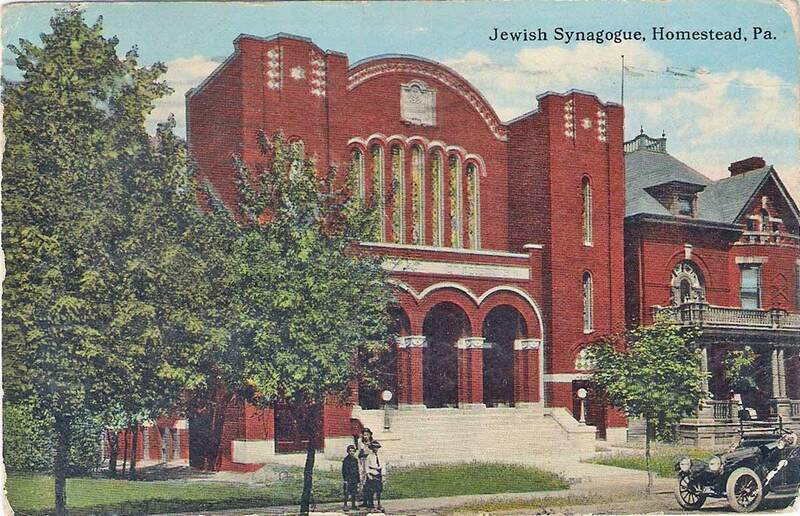 Those of us with deep roots in Western Pennsylvania can all point to towns like Homestead in our families’ histories where once there were thriving, well-integrated Jewish communities. When I go to Homestead and explain to people what I am doing there (because no matter how I dress they seem to recognize I do not belong), they say, “There were Jews in Homestead?” In one generation the entire narrative I just related to you was lost. The American Jewish community contracted in upon itself, withdrawing from small communities all over the country as that way of life floundered. Now they resent us, and we doubt them. We lose control of our narrative in the places we are not. But once we all broke bread together.